GABC has partnered with FACCNE and BluAge as they bring rising star and digital evangelist Stéphane Mallard to Boston during his US tour which also includes New York City and Dallas. In this accelerating environment of change, businesses can no longer wait for technology to disrupt their business: the imperative is now to disrupt or be disrupted. In a lively and informative presentation, Blu Age digital evangelist, Stéphane Mallard, provides a primer on the fundamentals of digital disruption focusing on artificial intelligence (AI), the accelerating pace of technological change, the commodification of knowledge and expertise (and the impact thereof on business strategy), and how businesses can learn to disrupt like the most disruptive enterprises. This event will be followed by food, drinks and networking. Stéphane Mallard is a French expert in digital transformation known for giving numerous conferences on topics such as artificial intelligence and its influence on human relationships. His promising young career is in full expansion and makes him one of the leaders of his theme. Stéphane learned to code as a teenager. He studied economics in Canada and went on to study political science at Sciences Po, Paris. 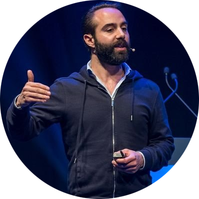 Stephane started his career in the trading rooms of a major European Bank as a digital evangelist. His role was to communicate the disruptive forces brought about by the digital revolution such as artificial intelligence, blockchain, quantum computing and more. He now works for Blu Age, a tech company that automates legacy systems transformation with a solution that entirely rewrites their code to make them digital-ready. Stephane gives talks throughout the world to raise awareness of the digital revolution and its impacts. This partner event is organized by FACCNE and BluAge with support from GABC and French Tech Hub.